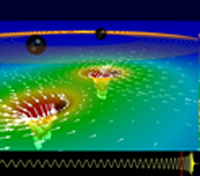 The Advanced LIGO gravitational wave detectors will begin taking data in 2015. It may be some time before the detectors reach design sensitivity. We expect to detect gravitational signals from distant astrophysical sources with Advanced LIGO and its sister observatories, and study the properties of the waves (testing General Relativity) and of their astrophysical sources (neutron stars, black holes, core-collapse supernovae, the Big Bang). All of our astrophysical data analysis is done in close coordination with the LIGO Scientific Collaboration and the Virgo Collaboration. We are preparing search pipelines that will rapidly identify astrophysical signals in LIGO and Virgo data, establish their significance above the detector noise, and flag them for additional study. We are especially interested in improving the performance of those pipelines for detecting binary systems with highly spinning black holes. Many astrophysical sources of transient gravitational waves will be accompanied by electromagnetic radiation, across the spectrum - radio, optical, X-ray, and gamma ray emission. In many cases, the radiation fades rapidly - in days, hours, or even minutes. We will use LIGO and Virgo data to rapidly locate sources in the sky, and alert our astronomical partners when and where to point their telescopes. Once a significant signal is established from a compact binary merger has been identified, we can extract the properties of the system by studying the detected gravitational waveform - the binary masses, the sky location, the distance, the orbital orientation, and even information about the spins of the binary component stars. We can build up a catalog of these observations to better understand the population of massive stars, binaries, and their evolution. Binary neutron stars lose orbital energy through gravitational radiation, and their orbit shrinks. They start tearing each other apart through tidal forces as they approach merger. 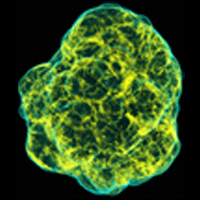 The way this happens tells us about the structure of nuclear matter in the extreme conditions found in neutron stars, informing both fundamental nuclear physics and the astrophysics of these fascinating objects. A massive star in the Milky Way Galaxy will undergo core collapse every 30-50 years or so. Its central core will collapse into a compact star (neutron star and/or black hole), emitting a huge amount of energy in neutrinos and in gravitational waves. 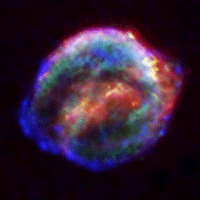 The shock from the collapse will propagate through the outer layers of the star, eventually blowing out those outer layers as a supernova with copious electromagnetic radiation. We hope to better understand the mechanism of the core collapse and the shock by studying the emitted gravitational waveforms. (With Caltech Theoretical AstroPhysics Including Relativity (TAPIR)). Gravitational waves come from regions of extremely strong, and rapidly changing, gravitational fields. The laws of gravity have yet to be tested in these extreme regimes, and there may be surprises. Einstein's General Relativity predicts how these waves couple to the matter at the source, how they propagate through space to us, and how they interact with our detectors. We aim to test these ideas and perhaps find evidence of physics "Beyond Einstein". (With Caltech Theoretical AstroPhysics Including Relativity (TAPIR) and JPL). The Big Bang probably produced copious gravitational waves (along with all of matter and radiation). The cosmic radiation from the Big Bang carries information about the universe, some 380,000 years after the Big Bang (before that, the light scattered from the hot plasma). The gravitational radiation has been travelling unimpeded since ~ 10-22 seconds after the Big Bang; so if we can detect it, it will tell us much about those first moments of the universe. The signals come from all over the sky, all frequencies, all the time; they merge together into a "stochastic background". Billions of years later, the first massive stars and binaries also produce an additional stochastic background. We aim to detect and study this. Extracting very weak signals of gravitational waves from our noisy detectors is a great challenge. Fortunately, there are well-established techniques for optimally extracting weak signals from Gaussian, stationary noise in data. Unfortunately, the Initial LIGO detector noise was not very Gaussian or stationary. Much effort is required to overcome the effects of non-Gaussianity and non-stationarity, with varying degrees of success in Initial LIGO. As the Advanced LIGO detectors begin operation, we are working to rapidly understand, diagnose, and fix any detector misbehavior that may be corrupting the data. We refer to this as Detector Characterization and Data Quality studies. The Initial LIGO data from our fifth and sixth science runs will become public in the coming years. We are preparing to release the data via the LIGO Open Science Center, LOSC. We want to make it as easy as possible for users (students, educators, numerical relativists, astrophysicists, etc.) to download the data and understand it, so we are developing a comprehensive suite of documentation, tutorials, scripts, and other tools. Modelling gravitational-wave signals from astrophysical sources is a fundamental part of gravitational-wave astronomy. By comparing detector data to simulations of gravitational waves from our models, we can extract the rich astrophysical information encoded in the waves. However, simulating gravitational waves can take up to hundreds of thousands of CPU hours per simulation and we require millions in practice. We are developing novel "Reduced Order Modelling" (ROM) techniques to allow us simulate gravitational waves within milliseconds without loss of accuracy, which will enable us to rapidly extract astrophysical information from gravitational-wave signals in detector data. (With TAPIR).